Notice in the picture, there is a serious potassium deficiency. Note the die back of the leave very little surface of either leave can contribute to the ripening of the fruit. 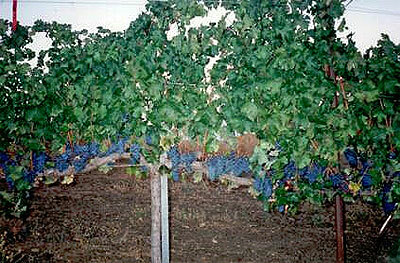 This is a comparison picture to show you the original sickly condition of this Cabernet Franc field. 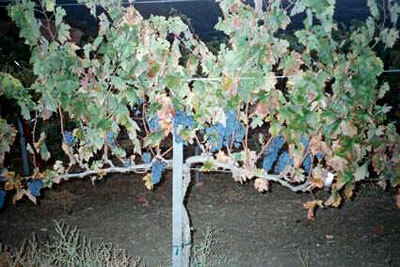 The photo is the sick row 'Notice' how little fruit is on the vine. Our 'test row' photo below is full and healthy, while the rest of the field is sickly and producing poorly. 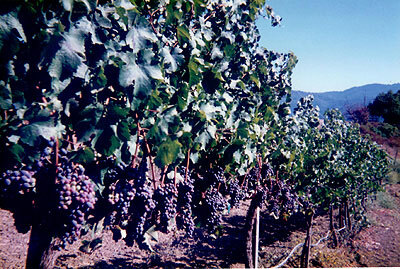 This is a picture of our VF-11 treated vine. Notice the abundance of fruit even when testing started after the blossoms had formed. Isn't it amazing that VF-11 was able to 'set' all those blossoms even on a sickly vine. The mix for the test was: One ounce VF-11 to one gallon water or one gallon VF-11 to 100 gallons of water which will fertilize approximately one acre. 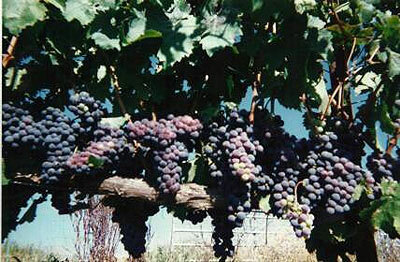 Healthy wine grapes require a 6 to 1…Potassium/Magnesium ratio. Notice the untreated vines are 2.8 to 1…this is deficient !!! The treated vines are 5.73 to 1…Potassium levels…this is almost PERFECT !!! This perfect balance was accomplished by merely foliar feeding with VF-11 Plant Food. AMAZING RESULTS IN SO SHORT A TIME. Notice the magnificent health that VF-11 has created in this potassium deficient sickly field. This test resulted in 300 pounds of grapes from this short test row. Just imagine the tonnage that could have been produced in the entire field. VF-11 balanced the micro and macronutrients (without adding anything to the soil) it also brought the sugar brix up a month earlier then would normally be expected….Thus eliminating damage from early rains. 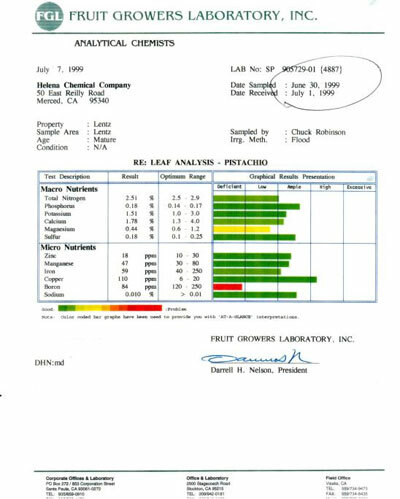 In 1999, a Pistachio farm received this Lab Report on the right. You can see that the micro and the macronutrients in his trees are 'out of balance' !!! The next year in 2000, VF-11 Plant Food was put to the test to see how it could improve this situation. 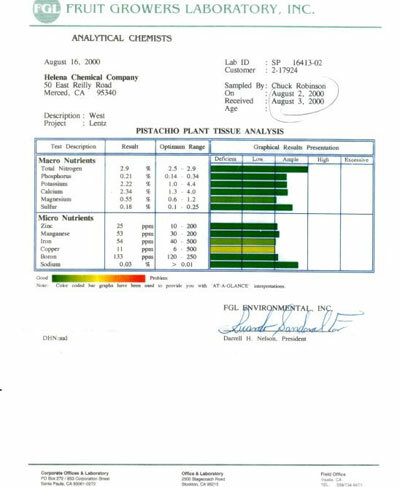 After only 6 foliar applications (2oz VF-11 to one gallon water, 3 weeks apart) another Lab Report was taken. It's was amazing !!! The neighboring Pistachio owner looked at this second report and said, "That's impossible !!!" You will understand why the neighbor made his remark when you examine the second Lab Report taken in 2000 after applying VF-11 only 6 times !!! Yes, anyone looking at the second report would have difficulty believing a gentle fertilizer like VF-11 could create an amazing 'balance' so quickly !!! Adding nothing to the soil !!! Proving once again That VF-11 is a "Breakthrough" !!! On the right, is the second Lab Report taken after only 6 foliar feedings with VF-11 on the same farm in Chowcilla, CA. (2oz VF-11 to one gallon water, every 3 weeks) Notice the PERFECT BALANCE of all nutrients in so short a time !!! And nothing need to be added to the soil !!! Keep in mind that VF-11 is very low in Nitrogen…it's almost 'uncanny' that it was able to bring up the Nitrogen so beautifully so quickly…proving once again VF-11 is a "Breakthrough' !!! And the fungal disease is already disappearing because VF-11 creates a perfect pH where fungal diseases can not 'take hold' !!! This should have been a 'short year' because of the alternate bearing branches, instead his crop increased from 2000 lbs per acre to 3600 lbs per acre !!! His processor said, "What are you using, this is the best crop in all California." 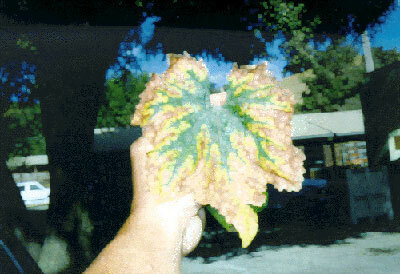 VF-11 is a 'godsend' to this generation of diseased trees and burned out soils. It's a "Breakthrough". Results are fast and obvious and money-making!